The Spin Transport program performs basic and applied research, and develops new measurement capabilities, to enable the development of high-speed, nonvolatile, magnetic memory. Techniques include time-resolved extreme ultraviolet (EUV) magneto-optics; ferromagnetic resonance (FMR) spectroscopy; spin-orbit torque characterization, including spin-Hall effect (SHE). The program fabricates and characterizes graphene as a spintronic material and applies hydrodynamic theory to the analysis of exchange interactions in ferromagnets with continuous rotation in the film plane. Geometry of vector network analyzer-based FMR spectrometer. Sample is placed face-down on a 50 Ω coplanar waveguide. Magnetic-field dependent perturbation of the transmitted microwave signal is measured over a frequency range of 1-70 GHz. Data are fitted to the Landau-Lifshitz equation. Fitting of ferromagnetic resonance spectra to the Landau-Lifshitz equation permits extraction of the magnetic anisotropy field and damping constant. In-plane FMR is sensitive to the in-plane anisotropy; perpendicular FMR is sensitive to the perpendicular anisotropy. The FMR linewidth is decomposed into damping (slope) and inhomogeneous broadening (intercept). 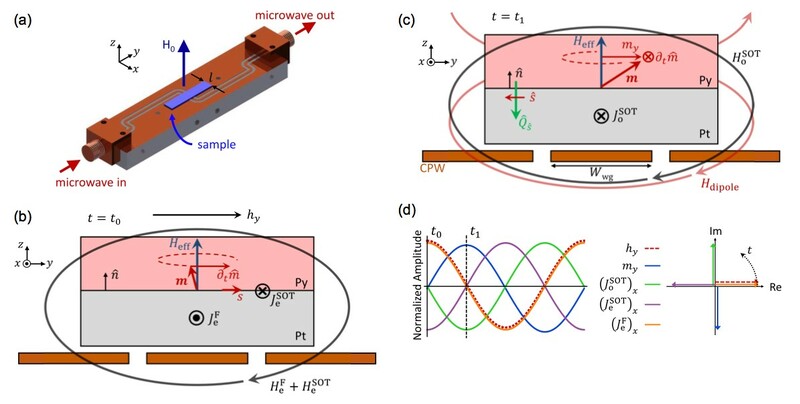 We developed a monolithic coplanar waveguide implementation of a Michelson interferometer for that reduces measurement time by two orders of magnitude in broadband ferromagnetic resonance (FMR) measurement. FMR spectroscopy is a commonly employed method for the characterization and optimization of materials for spintronics applications, such as nonvolatile memory. When used in a memory device, the magnetic films are engineered to be less than one nanometer in order to minimize the electrical energy required to write the bit. While FMR is capable of measuring such extremely thin magnetic films, the signal integration times can be on the order of several days for a single sample. We discovered that a simple cross structure in a microwave coplanar waveguide achieves an analogous effect as an optical beam splitter (key to the Michelson interferometer), such that the emitted microwave signal could be cancelled by 35 dB if the two arms, implemented with simple coaxial cable, were precisely adjusted to the same length. We then used the interferometer in an FMR spectrometer, where we discovered that the placement of a magnetic sample on top of one of the legs resulted in a resonant perturbation of the microwave transmission properties that could be easily detected in the interferometer output by use of a vector network analyzer. The end result was that the FMR signal could be measured directly, but with a 35 dB reduction in the non-magnetic background signal relative to what is routinely observed with the simple through-line structures currently used for broadband FMR spectrometers. By use of a rapid-prototype version of the new Michelson interferometer design in combination with a pre-existing FMR spectrometer, we demonstrated a 100-fold reduction in measurement integration times. In principle, measurements that currently require an hour can be done in less than half a minute with the new waveguide design. This speed-up enables rapid characterization of magnetic thin films important, for example, in the development of magnetic random-access memory (MRAM) or spin-torque oscillators (STO). Moreover, the increase in sensitivity from the Michelson interferometer opens up the possibility for measurements at the microscopic device level. Lithographically patterning the device in the Boulder Microfabrication Facility (BMF) at NIST will enable even more dramatic improvements in the sensitivity of inductive measurements of magnetic films. 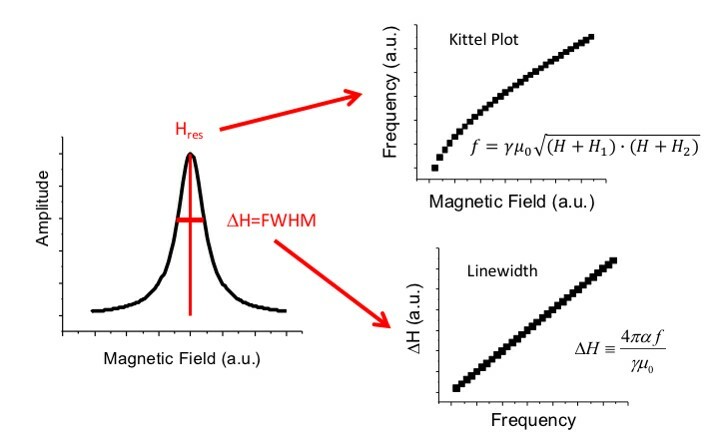 (a) Schematic of the Michelson-type microwave interferometer showing the dc applied field H0, the microwave applied field h1, the positions of the sample and reference, and the interferometer arm length L. (b) Schematic depiction of scattering processes in the interferometer for βL = nπ. Arrows represent traveling electromagnetic waves. Arrow width/color encodes electric field amplitude and arrow outline encodes sign. The first order scattering process (Ei → Ei/2 , wide to medium wide arrows) results in scattered waves of opposite sign at P1 (backscattering, dashed outline) and P2 and terminated arms (forward scattering, solid outline). At the terminations, these waves are reflected and invert sign. At the cross, the second order scattering process (Ei/2 → Ei/4 , medium wide to narrow arrows) results in two forward scattered waves with amplitude −Ei/4 per port. The three outgoing waves constructively or destructively interfere at Port 1 or Port 2. E. R. J. Edwards, A. B. Kos, M. Weiler, and T. J. Silva, "A microwave interferometer of the Michelson-type to improve the dynamic range of broadband ferromagnetic resonance measurements," IEEE Magn. Lett. 8, 3703404 (Feb 2017), doi: 10.1109/LMAG.2016.2640206. In order to fabricate devices combining graphene and FM materials, we developed a method for sputtering that does not damage the graphene but also yields high quality FM films with low damping. We found that deposition of an initial layer of 5 nm of Permalloy at grazing incidence preserved the integrity of the graphene, as verified with Raman spectroscopy, although the magnetic quality of the metallic film was compromised. 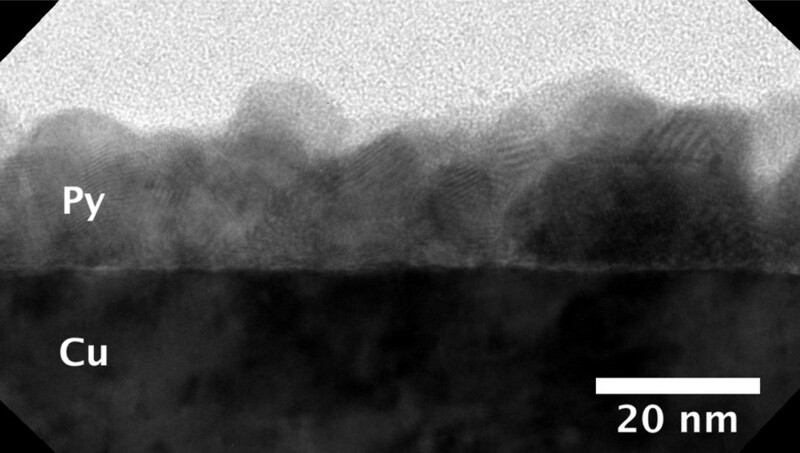 Subsequent deposition of more Permalloy at nearly normal incidence was sufficient to restore the nominal magnetic properties of the Permalloy film without damaging the graphene under the initial layer. With this two-angle sputtering method, we compared spin pumping from Permalloy (Ni80Fe20) films deposited on graphene/Cu(111) substrates and on bare Cu(111) substrates. In a spin pumping measurement, an alternating magnetic field excites spin precession in the FM film. Relaxation of the spin excitations at the FM/NM interface generates a pure spin current that flows from the FM into the nonmagnetic conductor. The loss of angular momentum due to the spin current increases the damping of the FM by an amount that is inversely proportional to the FM thickness. We used our highly accurate ferromagnetic resonance spectrometer to measure the damping as a function of thickness and thus quantify the spin current generated at the interface for co-deposited Permalloy/graphene/Cu and Permalloy/Cu samples. 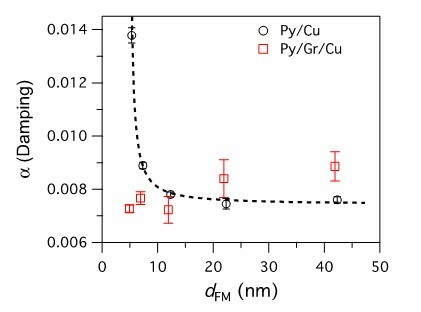 The bare Cu samples showed the expected increasing in damping for the thinnest films, but this effect was entirely absent for the graphene/Cu samples. Importantly, magnetometry on these samples showed that the Permalloy properties were nearly identical, so the difference in spin pumping can be attributed to the graphene itself. Our finding that graphene prevents the flow of spin current into the underlying Cu is consistent with the known contact resistance between graphene and Cu. This result opens the door to fabrication of graphene spintronic devices without the need to transfer the graphene to another substrate, thus avoiding a major source of contamination in graphene devices. This may be a key step toward realizing graphene's potential as a spin transfer medium. W. Gannett, M. W. Keller, H. T. Nembach, T. J. Silva, and A. N. Chiaramonti, "Suppression of spin pumping between Ni80Fe20 and Cu by a graphene interlayer," J. Appl. Phys. 117, 213907 (June 2015); doi: 10.1063/1.4921425. D. L. Miller, M. W. Keller, J. M. Shaw, K. P. Rice, R. R. Keller, and K. M. Diederichsen, "Giant secondary grain growth in Cu films on sapphire," AIP Advances 3, 082105 (Aug. 2013); doi: 10.1063/1.4817829. Spin-orbit torques at ferromagnet/normal metal (FM/NM) interfaces promise to be much more efficient as a means of switching magnetic memory elements than spin-polarized charge currents. The reason is intrinsic to the geometry employed for spin-orbit torques: an electric field applied parallel to the FM/NM interface results in a flow of angular momentum across the interface. Hence, even if the NM layer is extremely thin, the flux of angular momentum remains constant. Since the ohmic heating scales as the square of the charge current, this becomes a powerful means of minimizing the energy required to switch a FM memory element. We successfully measured spin-orbit torques in FM/NM bilayers, where the FM is Permalloy (Ni80Fe20) and the NM layers are Pt, Cu/Pt, Pd, Ta, Nb, and Cu/Au. We specifically measured the inverse forms of the spin-Hall effect (iSHE) and the Rashba-Edelstein effect (iREE) in these systems, where microwave stimulation of the FM layer gives rise to an ac voltage in the NM layer. With the iSHE, the spin chemical potential, generated by spin precession at the FM/NM interface, is converted to a charge current. On the other hand, the iREE directly converts the spin precession into a charge current, and with a phase that is shifted by 90 degrees relative to that of the iSHE. Microwave magnetic fields were applied with a proximate coplanar waveguide assembly, and the generated electrical signals in the multilayer samples were extracted by use of an electrically isolated, terminated waveguide structure. Our measurement method employs phase-sensitive detection to separate the two spin-orbit contributions to the measured microwave signal. Furthermore, a calibration reference component was included in the device design to permit separation of the spin-orbit torque contributions from any inductive signals. Our measurement results indicate that the Rashba-Edelstein contribution to the net spin-orbit torque is comparable to the spin-Hall contribution. These results will have significant implications for the utility of employing spin-orbit torques in three-terminal magnetic memory designs. Such designs have been proposed as a means of greatly improving the switching efficiency of spin-transfer torque magnetic random-access memory, a promising nonvolatile alternative to conventional CMOS cache memory in system-on-chip applications. (a) Geometry for vector-network-analyzer ferromagnetic resonance (VNA-FMR) measurements to extract spin-orbit torques (SOTs). Sample is a Ta/Permalloy/Pt trilayer. (b) Schematic of dynamic variables at instant of maximum excitation of charge currents even under time-reversal; Faraday’s Law and the inverse of the field-like interfacial Rashba-Edelstein effect. (c) Schematic of dynamic variables at instant of maximum excitation (T-odd) currents, e.g., the inverse spin-Hall effect. (d) Relative phases of excitation field, magnetization, and currents excited in non-magnetic layer. A quantitative analysis of FMR amplitude data yields information on charge currents generated by inverse spin-orbit torques. The methodology can be used with any phase-sensitive FMR instrument for films oriented in-plane and perpendicular to a static magnetic field. When combined with damping data, spin-diffusion length and spin-Hall angle can be extracted. A. J. Berger, E. R. J. Edwards, H. T. Nembach, J. M. Shaw, A. D. Karenowska, M. Weiler, and T. J. Silva, “Inductive detection of fieldlike and dampinglike ac inverse spin-orbit torques in ferromagnet/normal-metal bilayers,” Phys. Rev. B 97, 094407 (Mar 2018), doi: 10.1103/PhysRevB.97.094407. A. M. Humphries, T. Wang, E. R. J. Edwards, S. R. Allen, J. M. Shaw, H. T. Nembach, J. Q. Xiao, T. J. Silva, and X. Fan, “Observation of spin-orbit effects with spin rotation symmetry,” Nat. Commun. 8, 911 (Oct 2017), doi: 10.1038/s41467-017-00967-w.
A simple transformation of magnetization variables results in a fluid velocity that obeys the same conservation rules as compressible Eulerian fluids. Concept for dissipative exchange flow (DEF) of angular momentum from a spin source on the left to a spin drain on the right. Local excitation on the left causes the spin texture to precess globally. Damping results in dissipative reduction in fluid velocity from left to right. Analogous to drift in electron flow. For STT, precession frequency is is proportional to the net field. For DEF, precession frequency is is proportional to reciprocal damping. For STT, excitation amplitude is a function of the input torque. For DEF, excitation amplitude is saturated. For STT, the threshold torque is is proportional to damping. For DEF, the threshold torque is proportional to the square root of Hk (reciprocal domain wall width). The interchanged role of damping and anisotropy is intrinsic to the different topology of DEF. Red curves are for sub-threshold torque injection. Blue curves are for above-threshold conditions. Fluid flow “pulses” with anisotropy, but spin topology protects DEF characteristics for angular momentum transmission. E. Iacocca, T. J. Silva, M. A. Hoefer, “Symmetry-broken dissipative exchange flows in thin-film ferromagnets with in-plane anisotropy,” Phys. Rev. B 96, 134434 (Oct 2017), doi: 10.1103/PhysRevB.96.134434. E. Iacocca, M. A. Hoefer, “Vortex-antivortex proliferation from an obstacle in thin film ferromagnets,” Phys. Rev. B 95, 134409 (Apr 2017), doi: 10.1103/PhysRevB.95.134409. E. Iacocca, T. J. Silva, and M. A. Hoefer, “Breaking of Galilean Invariance in the Hydrodynamic Formulation of Ferromagnetic Thin Films,” Phys. Rev. Lett. 118, 017203 (Jan 2017), doi: 10.1103/PhysRevLett.118.017203.